Has anyone seen Daenerys' dragons? Anyone? No? I guess there's nothing left to do but hang up some flyers like you would with any other lost pet. HA. 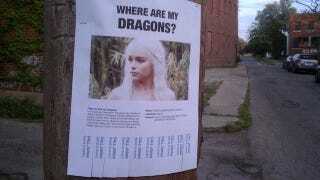 If you've seen them, call Jorah. Or, well, "Call" him. This image is credited to "the-faceless-men-of-braavos @ tumblr", who have proven (appropriately) difficult to track down. But to those faceless men, I say: Braavo. I hope you actually posted these all around the city where you live.